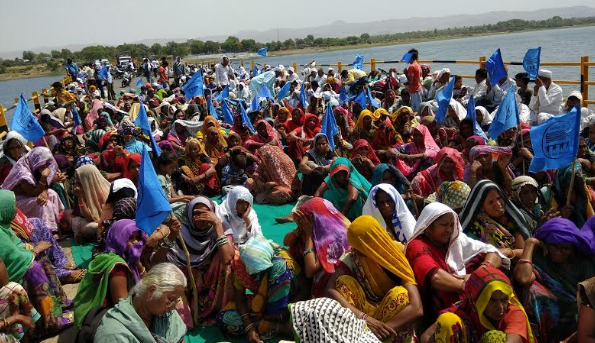 The powerful anti-dam organization, Narmada Bachao Andolan (NBA), stepped up pressure on Monday by creating a unique 10 km long human chain against the Narmada Control Authority (NCA), which is to meet on May 9 to decide on closing the Narmada dam’s gates, saying such a step would submerge 244 villages and a town. 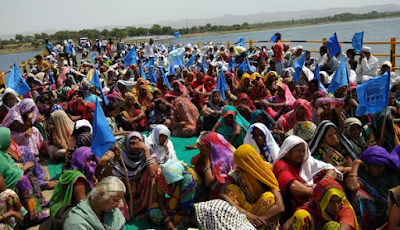 The NCA is the Government of India's inter-state body established under the Narmada (Water Dispute) Tribunal Award, is to finalize the dam’s height and other issues related with the Narmada project, including rehabilitating dam oustees. 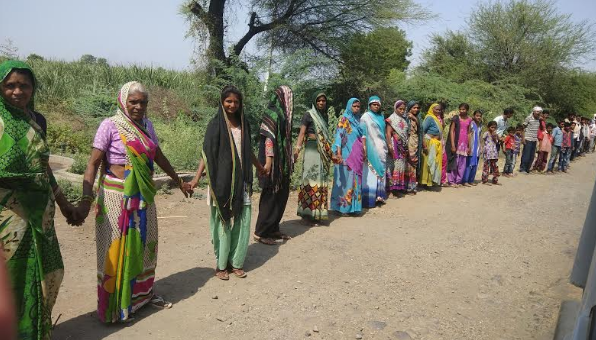 Participated by nearly 5,000 people from the Narmada valley, the human chain touched on borders of living village communities and on the banks of the river. The protesters raised slogans and placards against closing the dam’s gates, which would allow the dam’s reservoir to store water up to 139 meters. 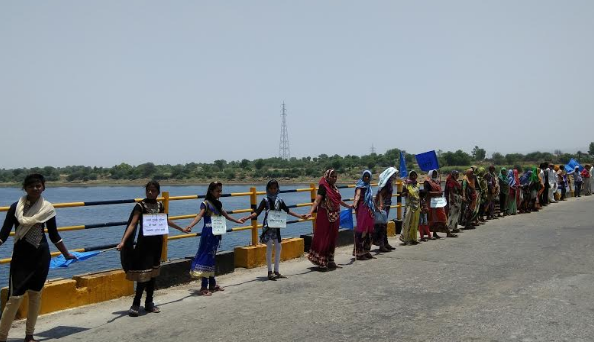 Project affected persons – women, men, children, farmers, fishermen, potters and labours –blocked Rajghat Bridge on the river in Badwani, on the border of Gujarat, holding a public meeting there. Among those who joined the human chain included former Madhya Pradesh chief minister Digvijay Singh, a known Narmada dam votary of yester-years, along with his Congress supporters. Participants said, thousands of families are yet to get the new package in lieu of land, announced by the Supreme Court. “Thousands of landless have not received any package”, one of them, Devram Kanhera, said. People from scheduled areas, especially tribals, said they would hold special Gram Sabhas in the coming days and pass resolutions bringing out facts and figures related to balanced rehabilitation. Their resolutions will form the legal basis for any further decision. “There are standing crops and massive plantations; thousands of pucca houses, schools, other public and private services erected; hundreds of temples, tens of mosques (as opposed to three temples claimed by the authorities), adivasi gods and worship places, all of which will be submerged”, they said. “There are lakhs of trees in the submergence area. People are continuing with their daily lives, and except for a few villages in the hilly mountainous region, falling in Alirajpur district, all other villages in the plains, at least 150 have large populations (hundreds of families in each) with functioning panchayats”, they added.